I just got these Monday and planted Tuesday. These ferns can be ordered in small or large quantities and look amazing when several are planted together....adds lots of bright green color! 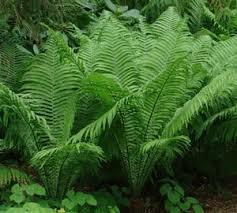 Ostrich Fern is also a common choice for gardeners as it grows best in areas that are damp and shady. Ostrich Fern - Matteuccia struthiopteris. The Ostrich Fern is native to North America and is a favorite ornamental plant in gardens that have even won the Royal Horticultural Society's Award of Garden Merit based on its performance under the United Kingdom growing conditions. The Ostrich Fern is very expansive as it rises vertically from a central crown, then grows out laterally. Once established, the Ostrich Fern grows to anywhere from three to six feet high and about as much broad. Ostrich Ferns have left of this plant usually about three feet long and curved gracefully at the tips, and the plant itself is nearly equally broad. The new leaves are called fiddleheads since their shape is similar to that of a violin stem. They were a favorite food for Native Americans and are still eaten in many parts of the county. Much like its name the fronds are very feather like and quite large as ostrich plums. Ostrich Fern are gorgeous fronds typically unfold in the summer and then start to tatter away by early fall and then dormant in the winter. A moisture loving fern, it does beautifully near a pond or water feature and quickly grows through underground runners, making it ideal and low effort ground cover. Damp shady areas with fertile soil are typical, serves equally well for borders, slopes, and as a backdrop for flowering plants such as daffodils and iris, whose bright flowers will stand out against the robust fern foliage. It is also very tolerant of rabbits which help protect it from scavenging. Ostrich Fern is often found along streams and ponds along shaded woodlands. It would be best planted along a lake or if you prefer against a wall so that it may fare better against the elements. You will see Ostrich Fern in Eastern and Northern Europe, Northern North America and eastern Asia. The ostrich fern would make a lovely addition to any landscape.